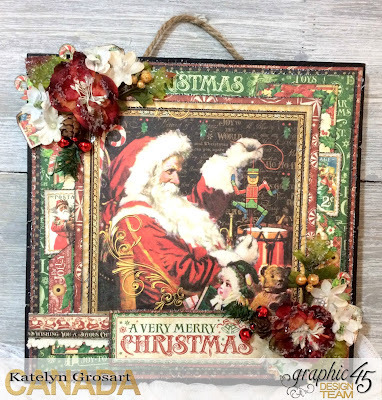 Today I'm back on the Graphic 45 blog with a vintage Christmas card featuring the St. Nicholas collection as well as a tutorial so you can recreate my card. 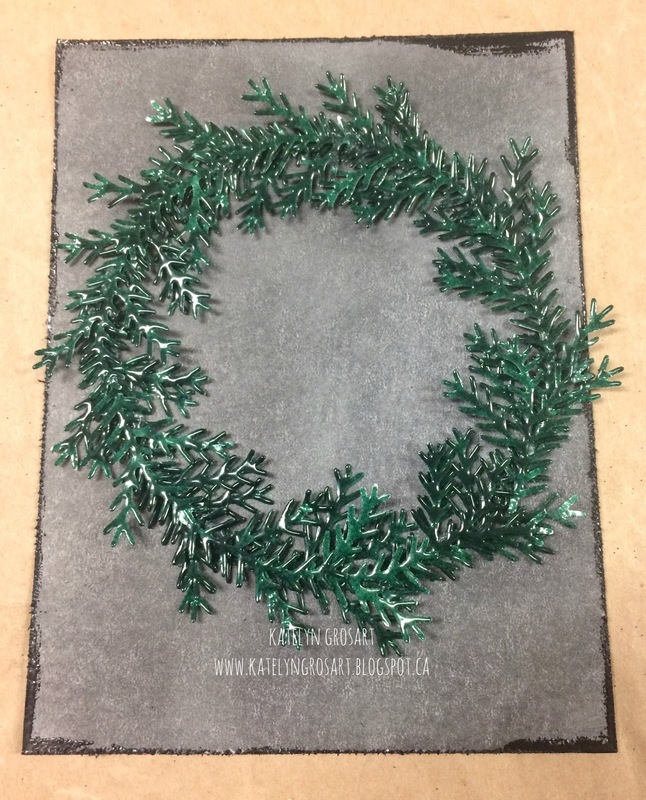 You'll want to head over to the Graphic 45 blog to check out the rest of the photos of my project as well as fellow design team member Maggi who has also created a fabulous Christmas project for you. 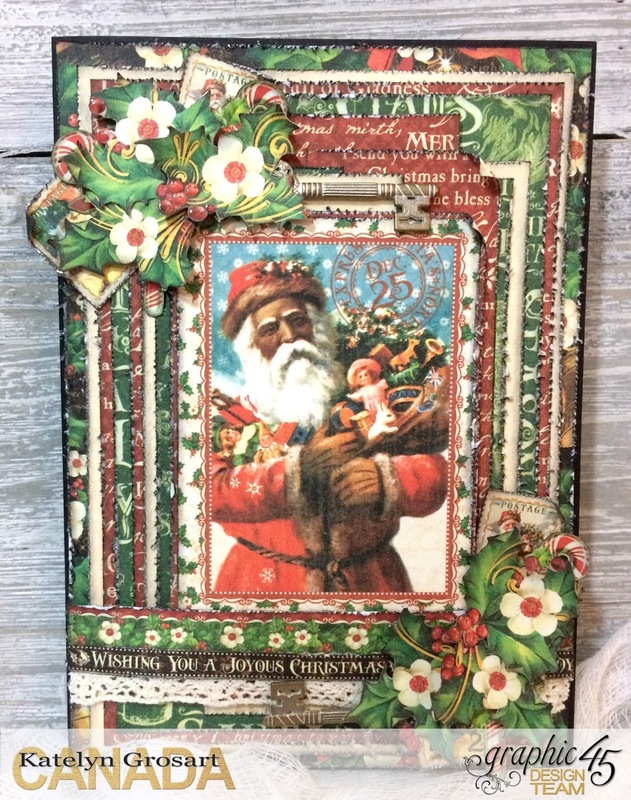 When I was starting out creating my card, I decided to use the St. Nicholas collection as it was the perfect jumping off point for creating my Christmas Card. 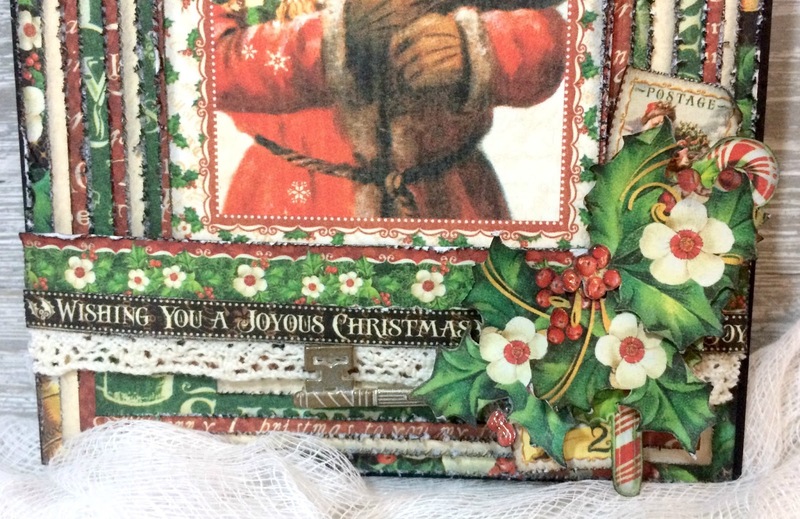 By layering in keys from the staple line, fussy cut images from the St. Nicholas collection and ribbon, I was able to create a beautiful layered Christmas card. To see more pictures of my Christmas card, you'll want to head over to the Graphic 45 blog. Thanks for stopping by and make sure to head over to the Graphic 45 blog to check out the rest of the photos of my project as well as Maggi's fabulous project! 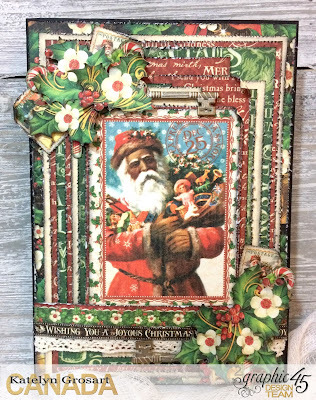 I'm busy working on project in my crafts room today, but I wanted to stop in to share with you a sneak peek of my Wishing you a Joyous Christmas project for Graphic 45. You'll want to mark your calendars for Wednesday, November.30th as I will be up on the Graphic 45 Blog sharing my project. On Wednesday I get to share the blog with Maggi who has also created a beautiful project for you. I hope that you'll take the time to stop by the Graphic 45 blog and check out both of our projects. Make sure to check back on my blog on Wednesday as I will be sharing more photos of my project. I'm back on the Elizabeth Craft Designs guest blogging . Today I've created for them a fun Happy Holidays Christmas Card that features a variety of their dies, paper, adhesives, glitter and stickers. You'll want to make sure to head over to Elizabeth Crafts Designs Blog to read all about how I created my Happy Holidays Christmas Card, so that you'll be able to recreate it at home. Stay tuned next month as I will have some more projects for you featuring Elizabeth Craft Designs product. 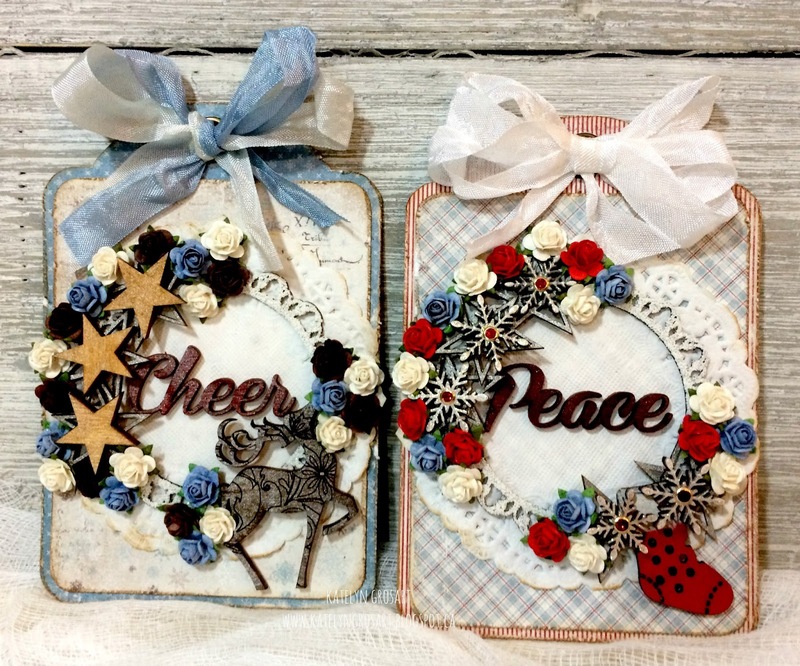 I'm back on the Southern Ridge Trading blog today to share with you some inspiration for our current monthly challenge which is all about "Christmas/Winter". It's hard to believe that Christmas is exactly a month, so I've created a set of Gift Tags that will be sure to inspire you as well as get some of your Christmas crafting done. Make sure to head over to the Southern Ridge Trading Company Blog so that you can learn all about how I created my Gift Tags. While you're checking out my project, make sure to participate in our monthly challenge. You can find all of the details here on how to enter. I'm back on the Creative Scrapbooker Blog today as a guest blogger sharing my Believe Advent Calendar featuring Southern Ridge Trading Company, Ranger Ink and Emerald Creek Craft Supplies products. 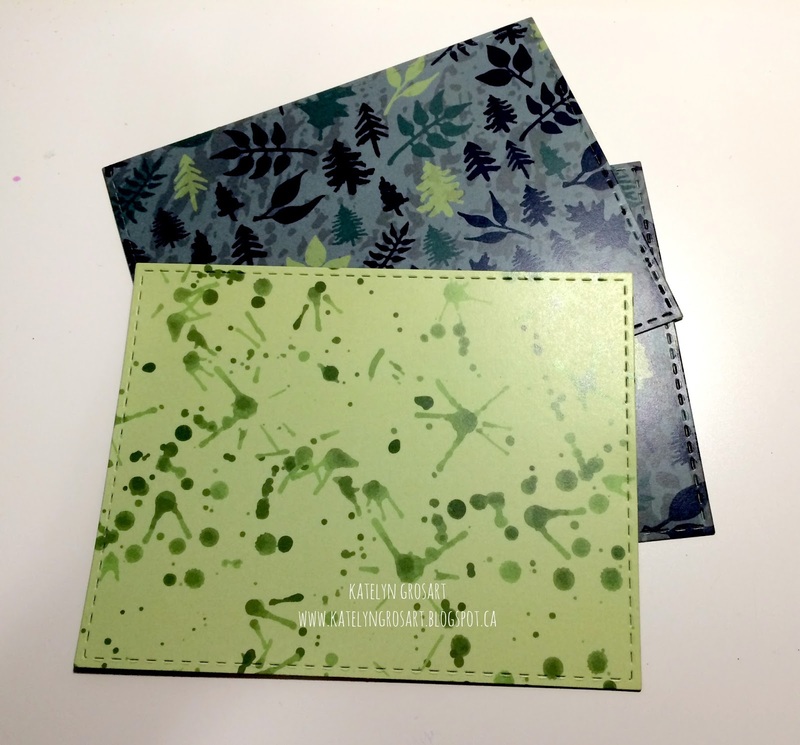 Today I'm excited to share with you a new wonderful Canadian Manufacturer who manufactures patterned paper. 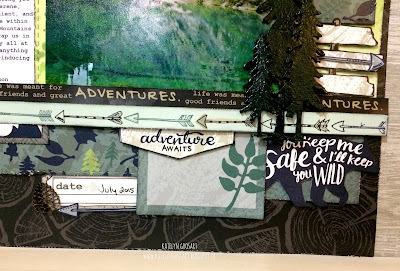 Wild Whisper manufactures 12x12 paper collections, 4x6 and 3x4 card packs as well as they carry a boutique of embellishments. To kick off the launch of the company, there are 8 designers from across Canada blog hopping and featuring projects using Wild Whisper's "Adventure" and "Holiday Style" collections. If you been following the blog hop, you should be coming from Cathy's blog. My project for the blog hop is a scrapbook layout featuring the "Adventure" collection. Grab a cup of your favourite beverage and enjoy the tutorial below so that you'll be able to recreate my layout at home. Make sure to read the entire blog post so that you can head over to the next designer's blog as well as there is another surprise at the bottom of the post. To start, take four chipboard pinecones out of the set and lightly apply Vintage Photo Distress Ink overtop each pinecone with a blending tool. Take one wood fall leaf out of the set and apply Pine Needles Distress ink overtop of it with a blending tool. 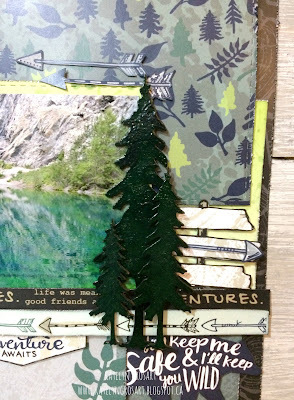 To finish off the chipboard and wood elements, apply Emboss It ink to the three cedar trees. 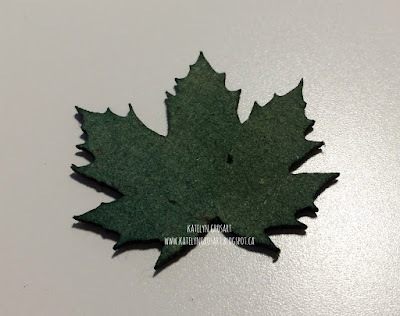 Once the ink has been applied, sprinkle Topiary Green Embossing Powder overtop of the trees. 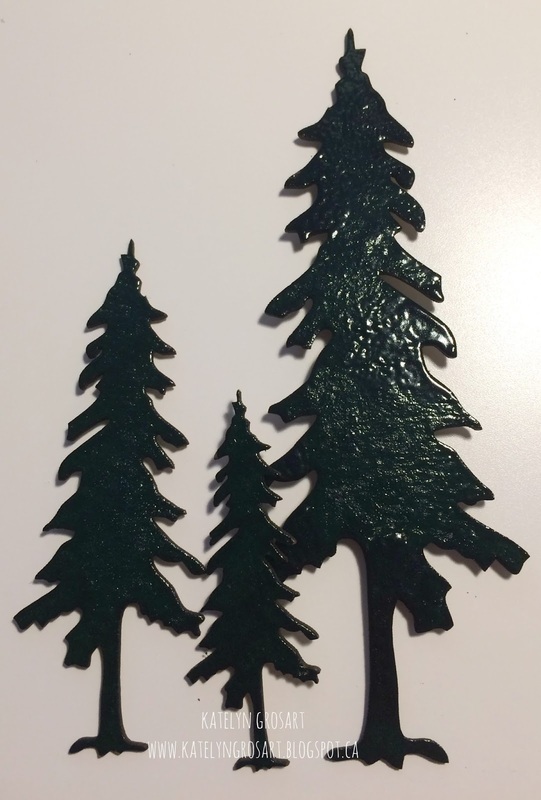 Tap off the excess powder from the trees and emboss them with your heat tool. To add some extra interest in behind the photo, I cut out 3 stitched rectangles using Elizabeth Craft's Stitched Rectangles die. The extra elements that I used to embellish came from the 4"x6" and 3"x4" cards and one of the sheets of patterned paper that has a variety of bears on it. You'll also want to choose 2 - 4"x6" cards and 4 - 3"x4" cards out of the Adventure card pack. Find to border strips that you like from the bottom of the patterned paper and cut them off. Make sure to also cut a piece of patterned paper that measures 3 1/4" x 4 1/4" to adhere a card to. 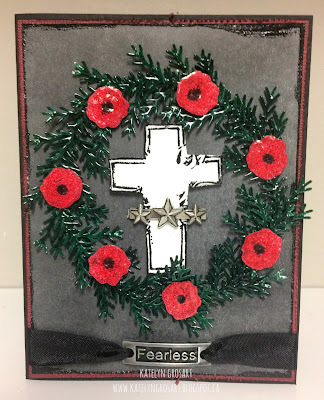 Before assembling your layout, edge distress the edges of the patterned papers, 4"x6" cards, 3"x4" cards, two border strips and the stitched rectangles. Once the edges have been distressed, ink the edges of the patterned papers, 4"x6" cards, 3"x4" cards, two border strips, stitched rectangles and fussy cut images with Black Soot Distress Ink and a blending tool. With all the elements now inked, it's time to assemble your layout. 1. Adhere the 4"x6" journaling card to the other 4"x6" card leaving 1/4" around the top and left hand sides. Once the two cards have been adhered together, adhere the 4"x6" cards 1" from the left and 2" from the top of the grey/black wood paper. 2. 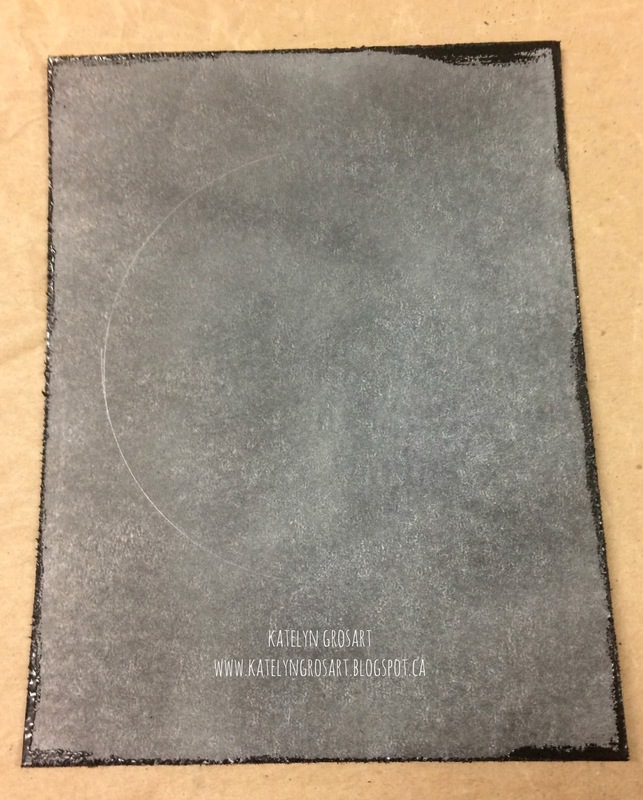 Adhere one of the 3"x4" cards 3/8" from the right and 1 1/4" from the bottom of the grey/black wood paper. Adhere a second 3"x4" card 1/8" from the right and 4 5/8" from the top of the grey/black wood paper. 3. Foam square one of the stitched rectangles that has the leaves on it and adhere it 1 3/8" from the left and 1 3/4" from the bottom of the grey/wood paper. Foam square the second stitched rectangle with leaves on it and adhere it 3/8" from the right and 2 1/8" from the top of the grey/black wood paper. 4. Adhere the fussy cut label image slightly underneath the bottom stitched rectangle. To finish the label, add the date, adhere an arrow at the bottom of the label as well as adhere a chipboard pinecone to the left side of the label. 5. Foam square the third 3"x4" card 7/8" from the bottom and 2 5/8" from the right of the grey/black wood paper. With the third card now adhered, foam square the bear with writing on it and adhere it to the right of the third card, it will sit on the first 3"x4" card you adhered. Adhere the fourth 3"x4" card to the 3 1/4" x 4 1/4" patterned paper. Foam square the fourth 3"x4" card that's now attached to the patterned paper 7/8" from the left and 5 3/8" from the top of the grey/black wood paper. To finish off this layer, you'll want to foam square the sign marker and adhere it overtop of the second 3"x4" card. To add some extra interest to the sign marker, adhere an arrow to the middle sign. 6. Adhere your picture to the green spot stitched rectangle. Foam square the green spot stitched rectangle 3 7/8" from the left and 4 3/8" from the top of the grey/black wood paper. With the green spot stitched rectangle adhered, lift up the top left hand corner of the rectangle and adhere the wood leaf underneath the corner so that a bit is showing. Place the corner back down and adhere three pinecones in the top left hand corner. 7. Adhere the first of the two border strips 3 3/8" from the bottom of the grey/black wood paper. Adhere the second border strip slightly overtop of the bottom of the first border strip. 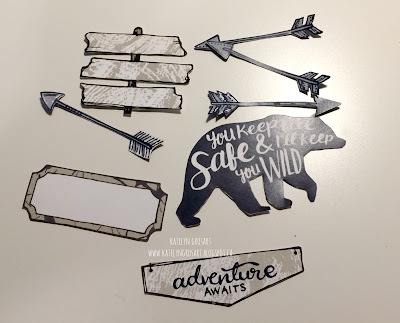 With the border strips adhered, foam square the adventure awaits sign slightly underneath the border strips 3 3/8" from the right hand side of grey/black wood paper. 8. Adhere the three trees on the right hand side of the photo. To finish the top of the green spot rectangle, adhere the two arrows. Now I mentioned at the top of the blogpost that there would be an extra surprise for you if you read all the way to the bottom of my blogpost. Well, Wild Whisper is giving away both the Adventure and Holiday Style collections, which includes the card packs. 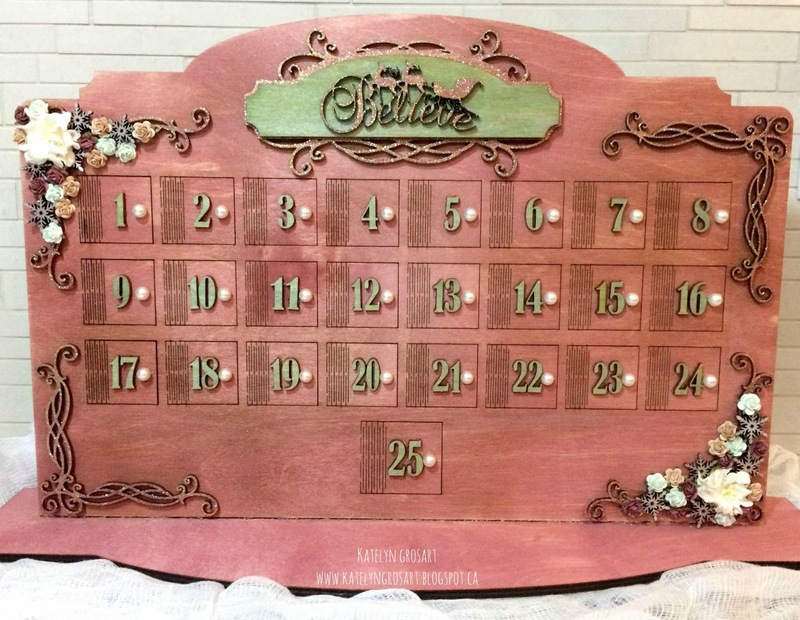 When you comment on all of the blog posts from the blog hop, you'll be entered in to win the prize. Please note that this contest is open to our international readers too! You only have one week to comment (comments close on Friday, November.25th) and then the wonderful ladies of Wild Whisper will announce the winner on Saturday, November.26th. Thanks for taking the time to visit my blog and checking out my project. To order your own collection of Wild Whisper products you'll want to head here. 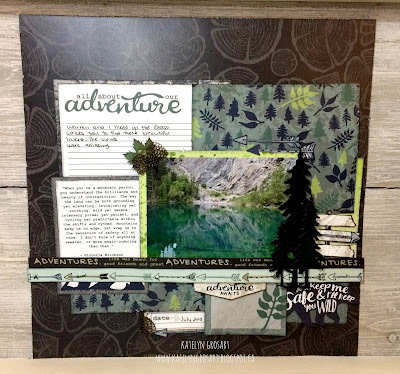 Now make sure to head over to Heather's blog to check out her fabulous project. 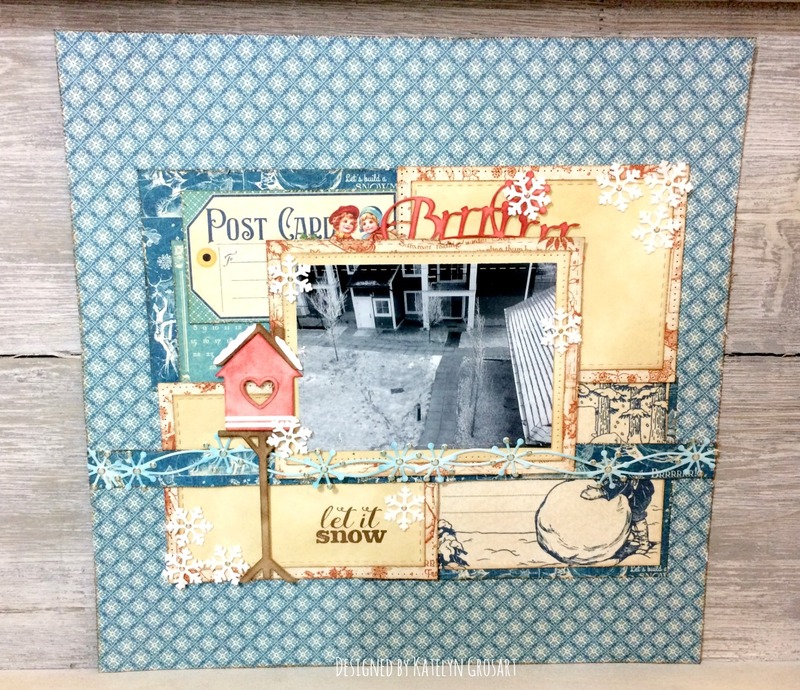 Today on the Graphic 45 blog, we continue our blog hop with Petaloo and Xyron. For this blog hop we were challenged to create a home decor piece featuring Petaloo's flowers and Trims, Xyron's Adhesive and Graphic 45 products. 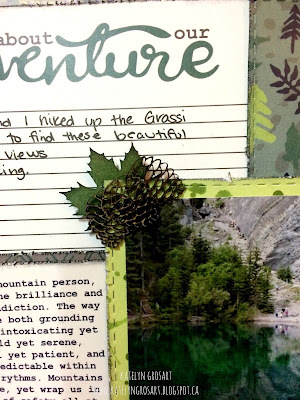 You'll want to head over to the Graphic 45 blog to check out the rest of the photos of my project as well as fellow design team member Alexandra who has also created a fabulous project for you. Once you've finished checking out our projects, you'll want to pop over to Petaloo's blog and Xyron's blog to see what their design teams have created. 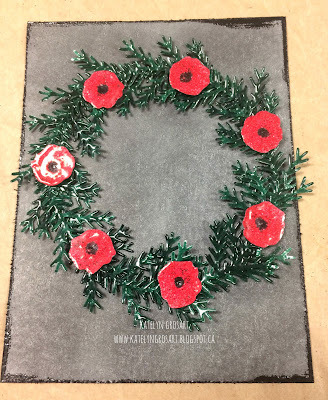 Christmas is right around the corner and there is no better time to start getting some of your holiday home décor crafts started. For my project I took a wood plank wall hanging that I found at my local craft store and created this fun Christmas home décor piece featuring St. Nicholas from Graphic 45, a variety of Petaloo Flowers as well as some fantastic adhesive from Xyron to keep all the elements together. Tip: Use a variety of flowers and sprigs to create add extra interest in two of the corners on your project. To see more pictures of my St. Nicholas Wall hanging, you'll want to head over to the Graphic 45 blog. Thanks for stopping by and taking a look at my wall hanging. You'll want to make sure to head over to the Graphic 45 blog to check out the rest of the photos of my project as well as Alexandra's fabulous project! It's an exciting day today as I finally get to share with you that I will be getting to be a guest designer for Elizabeth Craft Designs for the month of November and December. Today is my first post with them and for it I created a fun Let it Snow scrapbook layout that features a variety of their dies, paper, adhesives, glitter and stickers. 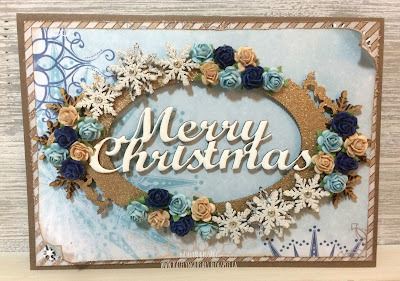 You'll want to make sure to head over to Elizabeth Crafts Designs Blog to read all about how I created my Let it Snow scrapbook layout, so that you'll be able to recreate it at home. Stay tuned later in the month as I will have another project for you featuring Elizabeth Craft Designs product. 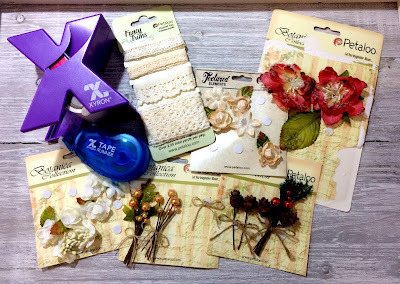 I've been busy in my craft room crafting today, but I thought that I would stop in to share with you a sneak peek of my St. Nicholas project for Graphic 45's, Petaloo and Xyron Blog Hop happening next week. You'll want to mark your calendars for Tuesday, November.15th as I will be up on the Graphic 45 Blog sharing my project. On Tuesday I also get to share the blog with Alexandra who has also created a fantastic project for you. I hope that you'll take the time to stop by the Graphic 45 blog and check out both of our projects. I will be sharing on Tuesday with you some of the photos of my project on my blog. I'm up on the Southern Ridge Trading blog today to share with you some inspiration for our current monthly challenge which is all about "Christmas/Winter". With the challenge in mind I created a Merry Christmas card that's sure to inspire you. 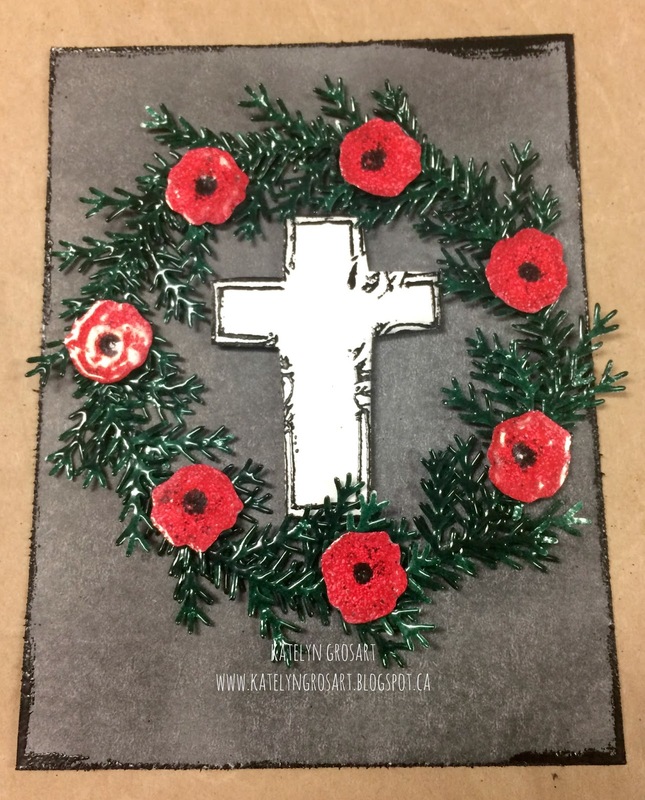 Before you head over to the Southern Ridge Trading Company Blog, I would like to wish you a Happy Remembrance day and thank those who have fallen, those who have fought for our country, and those who are still fighting for our country. Thank you! 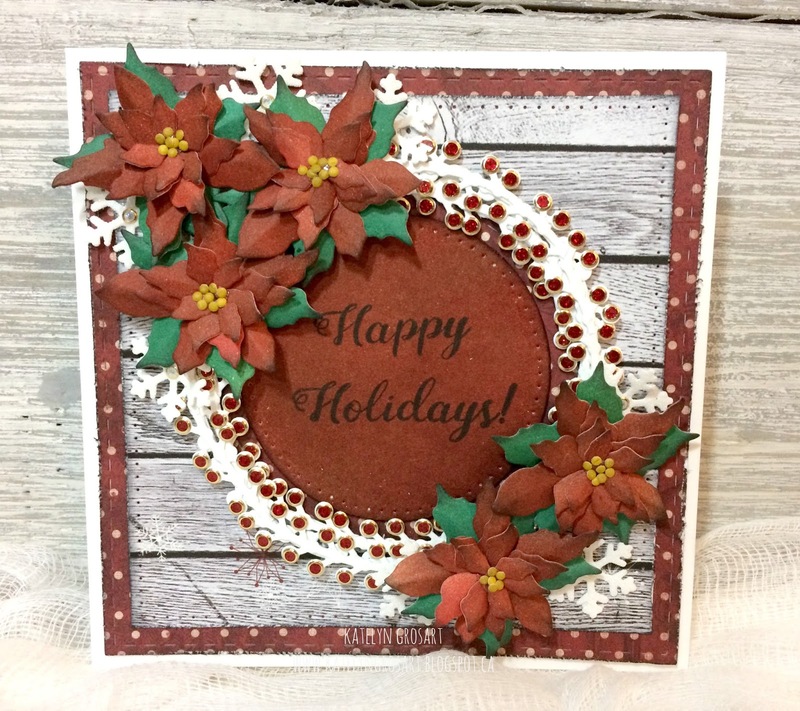 Make sure to head over to the Southern Ridge Trading Company Blog so that you can learn all about how I created my Merry Christmas card. While you're checking out my project, make sure to participate in our monthly challenge. You can find all of the details here on how to enter. We're kicking off a new monthly challenge on the Emerald Creek Dares blog today. It's all about Heartfelt Freedom and Festivities as we remember those who have fallen for us, Thanksgiving in the U.S. and the start of creating Christmas cards and gifts. To start our "Heartfelt Freedom and Festivities" month long challenge, the design team has created some wonderful projects using the heartfelt freedom theme. For my piece, I created a "Fearless" card for all of those who have fallen, those who have fought for our country and those who are still fighting for our country. To start, you'll want to blend Black Soot Distress Ink onto a piece cut at 4" x 5 1/4" of 100lb White Cardstock. Once your happy with the how much black ink you have on your cardstock, dry your piece with a heat tool. 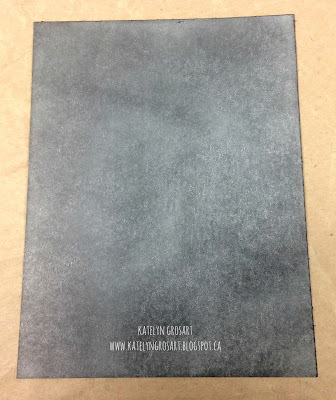 Once your piece of cardstock has dried, run your Ranger Ink Emboss It dauber along the edges. With the ink on the edges, sprinkle Fine Midnight Black Embossing Powder along the edges. Tap off the excess and emboss with a heat tool. Find an object that is circler and will fit on the card front, lightly trace around the circle. 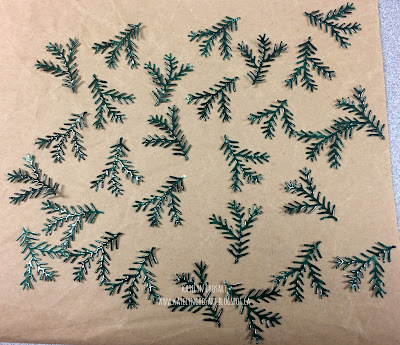 Punch out 28 pine branches using Tim Holtz's Pine Punch - Large and 100lb White Cardstock. Apply Ranger Ink Emboss it Ink to a pine branch, sprinkle Topiary Green Embossing Powder overtop of the pine branch and tap off the excess powder. Emboss with your heat tool. 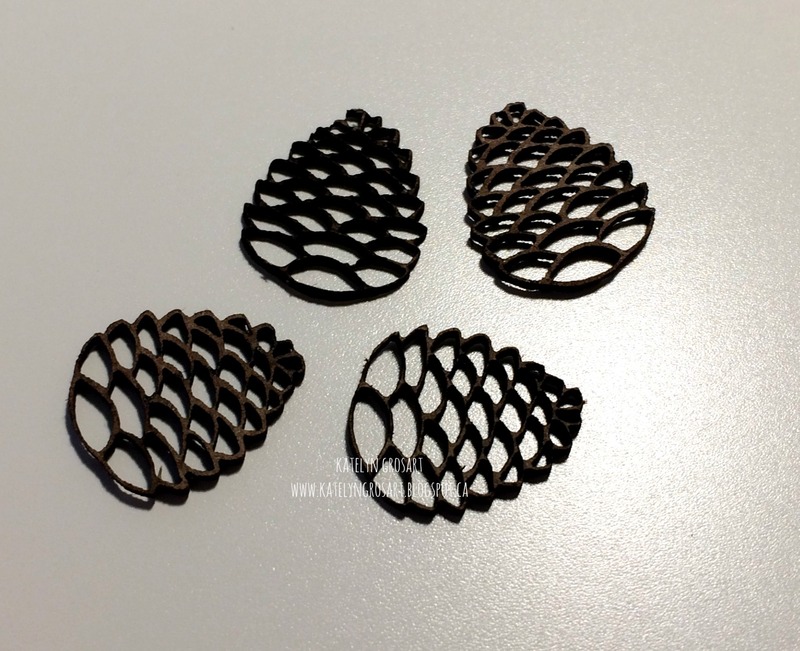 Continue the previous two steps until all the pine branches are embossed. 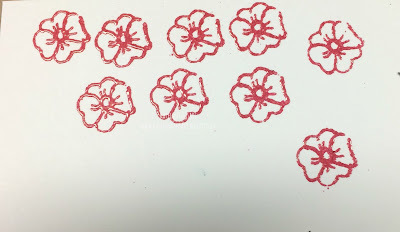 Apply Ranger Ink Emboss it ink to the single flower stamp from Nicole Wright's Falling Blossom stamp set and stamp onto a piece of scrap 100lb white cardstock. Continue apply emboss it ink to the flower stamp and stamping onto the white cardstock until you have 8 flowers. Sprinkle Candy Crimson Red Embossing Powder overtop of the flower. Tap off the excess powder and emboss with a heat tool. Using a Ranger Ink Emboss it pen, colour the inside of each of the flowers in, except for the centres. Sprinkle Candy Crimson Embossing Powder and tap off the excess embossing powder. Emboss with a heat tool. To finish the centres of the now poppies, using the emboss it pen, colour the middle. Sprinkle Fine Midnight Black Embossing Powder to the middle of the flowers and tap off the excess. Emboss with your heat tool. Once the centres have dried, fussy cut the poppies out. 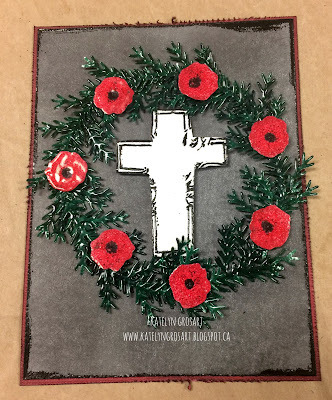 With the poppies cut out, ink around the edges of them using Black Soot Distress Ink and a blending tool. 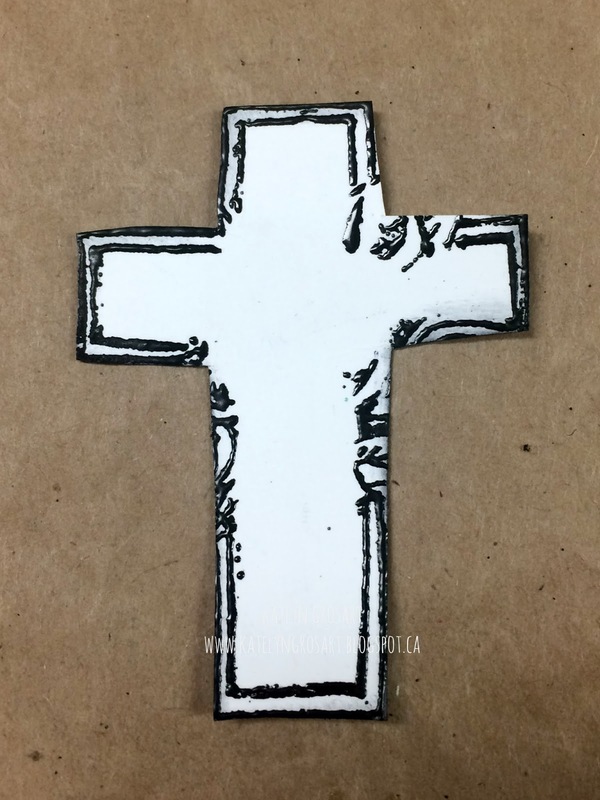 Using the Ranger Ink Emboss It pen, trace the Cross stamp and stamp onto a scrap piece of 100lb White Cardstock. Sprinkle Fine Midnight Black Embossing Powder overtop of the cross and tap off the excess powder. Emboss with your heat tool. Once the cross has cooled, cut it out. With all the elements now finished, it's time for adhering the elements together. Start by adhering a layer of pine branches around the circle you traced out. Once you've done a complete circle, start again by adhering the next layer of pine branches slightly off from the first set. 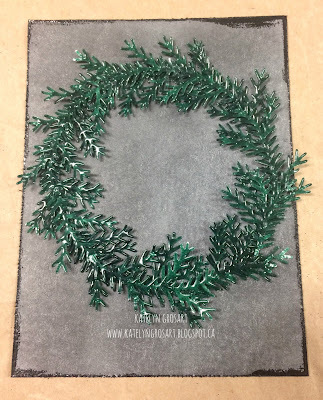 Continue adhering the pine branches around the circle until you've ran out, then you know you have enough branches on your wreath. 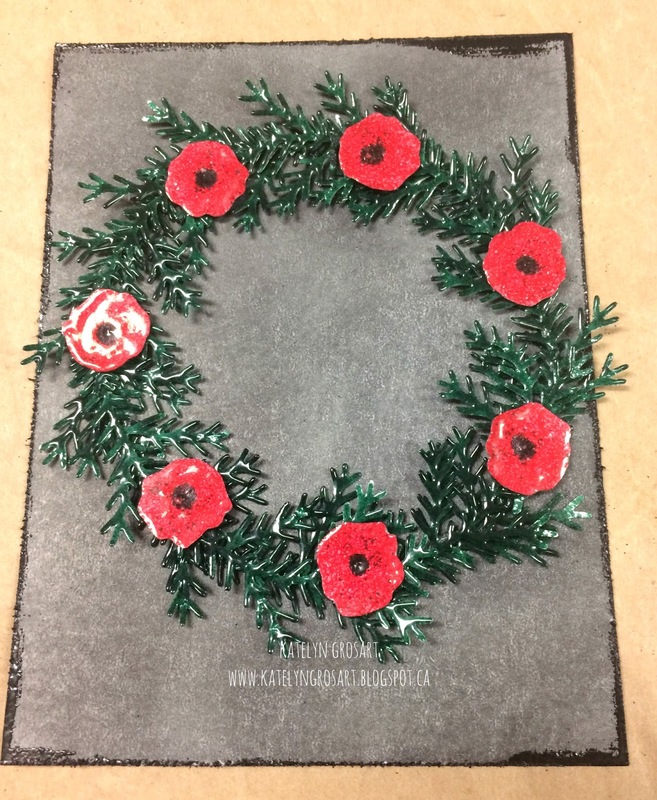 Adhere 7 of your poppies around your wreath as desired. 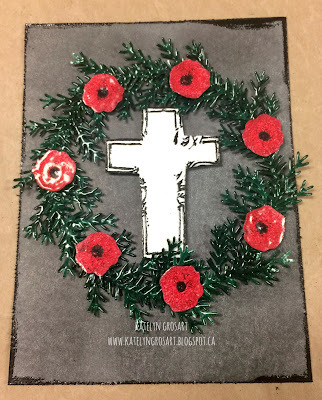 Using Foam squares adhere the cross image to the middle of the wreath. When I adhered mine, I tried to get some of the branches to lay near it. Cut a piece of dark red core'dinations paper that measures 4 1/8" x 5 3/8". Edge distress the edges and then ink them using Black Soot Distress Ink. Adhere your card front to the red piece of cardstock. To finish the card front, adhere a Three Star Metal Band, mid way up the cross. Remember to cut the eyelets off on either side. 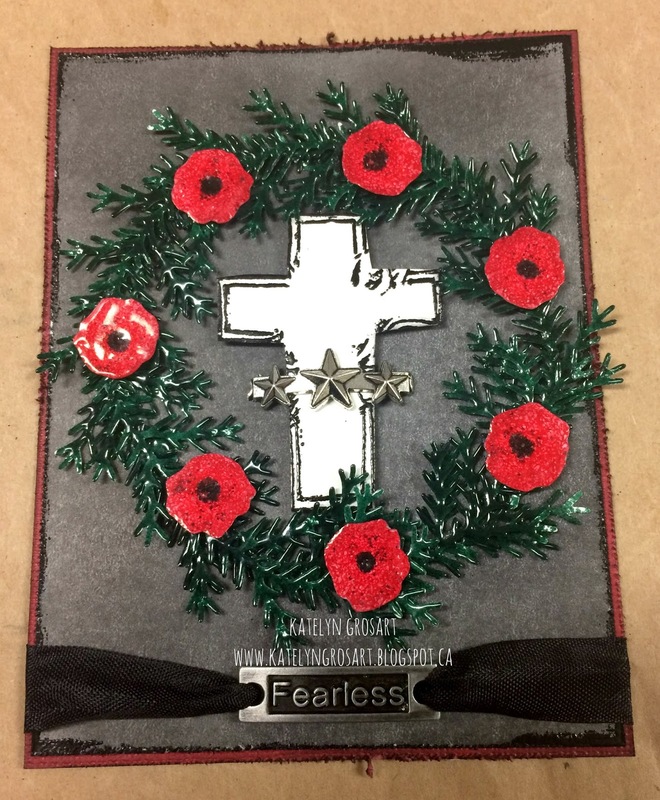 Run a piece of black ribbon through the Fearless Charm and adhere the Fearless charm at the bottom of the card front. Here's the card with all the elements together. Thanks for stopping by and checking out my Fearless Card. Don't forget to enter your project into our Emerald Creek Dares Challenge for your chance to win a $50.00 gift certificate for the Emerald Creek Store!